Over the past month some massive games have been released, Medal of Honour, New Vegas and Garden Simulator. What can we expect in November? The big dog returns to rule the roost with the upcoming release of Call of Duty Black Ops and our favourite football game comes back for another year with Football Manager 2011. Read on for the month ahead in PC gaming. The most unusual thing about Mafia 2 from the offset is that it’s quite frankly, the most linear ‘open-world’ game I’ve ever played. It seems like a heck of a juxtaposition to set this tale of guns and gangsters in a generously sized, bustling city only to then limit any exploration of said city itself by ensuring you follow a strict set of instructions: Go here, drive here, shoot these guys, drive back, go to sleep. This is pretty much repeated throughout most of the game, and you’re never encouraged to explore, which seems baffling giving the scope of Empire City. The only real opportunities to explore are during periods when you’re told to go to bed, but you’d have to be willing to ignore the instructions and prompts flashed up on screen. It seems very counter productive to the game, even if Mafia has always prided itself on it’s story. It’s like an artificial corridor has been placed around your enjoyment, and is very counter productive to those little stories that come from exploring the world itself and going off the beaten track that other open world games do so well. Still, although the missions are very similar, I have to admit that there’s nothing particularly bad about them as such. Occasionally you’ll be beating down people in a fistfight, or transporting a dead body to a grave without the cops seeing or indeed just chasing down greasers in a car, which is pretty standard fare these days for this sort of game. This is however broken up by some interesting little asides, including selling cigarettes, helping a lady with a broken down car. However, there’s a continuous nagging feeling that this would have been far more organic if these sort of things didn’t happen during the course of a mission, and could be undertaken as a minigame in-between the main storyline. Combat is brief enough to not feel like a chore, but there’s rare variety in firefights, especially when most of the standoffs take place in places filled with the old chest high scenery syndrome. It’s slightly more believable than most games of it’s ilk, but once you’ve found a go-to gun you rarely feel a need to switch for all but the most difficult of fights. Not that you’ll run into difficulties that often. The game is fairly straightforward, even on Hard difficulty. 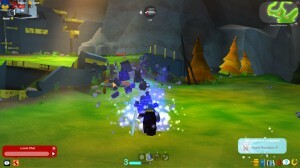 There’s certainly no infuriating race mission like in the first game, and it’s only in the very latter stages you’ll really run into much bother from using the same tactics – the final fight utilizing the only notable way of changing the norm of firefights by ensuring goons can come in from all sides, forcing you to move out of cover and take a more dynamic approach to the combat. The driving is also pretty easy to get used to, even in different cars which don’t feel massively different from one another except at the extremes. 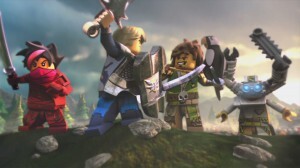 The thing is, at the end of the day the way the game feels in terms of combat and overall gameplay isn’t particularly bad – it’s not shoddy and it’s extremely rare you’ll feel cheated by the AI – it’s just most of them are not particularly memorable for being beaten in any way other than ‘find one good piece of cover and stay behind it’. 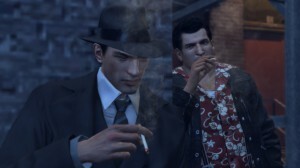 The thing is though – and it’s a fact that can be easily forgotten – is that Mafia 1 wasn’t a particularly flawless game. Far from it, irritating missions, tough to the point of unfair combat and slightly too eager police AI meant that it too was a game that was flawed. The diamond in the first game’s rough was it’s story. Deftly told, and ending on an amazingly sombre note it was one of the best examples of storytelling in games, particular in a genre not usually famous for amazing stories. 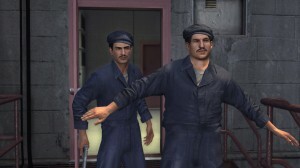 The problem with Mafia 2 is that the flawed game is also pretty flawed in the story department. Like before, our protagonist is wanting to go from nobody to made man, and like before he has a best friend that helps him along but is rather headstrong. This time around though, beats are predictable and Vito himself just isn’t very likeable. He’s a lazy man that just wants to fast track to the top, and while that is a change from most stories about good-guy doing bad things for a greater good, it leaves you not really rooting for Vito, and more pushing his story along just to see the conclusion. Again, the linearity prevents you from truly exploring what his new status as a made man actually means for him other than just a different save room at the end of each mission. More disappointingly is how stunted the story is. It seems like a far shorter game than it’s predecessor, and most of the game is geared towards Vito and Joe getting into the Mafia rather than the drama once they’re in there – it all happens a bit too fast, and when key story moments happen, you end up feeling slightly more disconnected than you should, as we’re never quite given the time to get to know any other characters than the two most important ones. However, when it comes down to it it seems a little unfair to compare Mafia 2 to it’s predecessor when it’s forefather is held in such high regard. 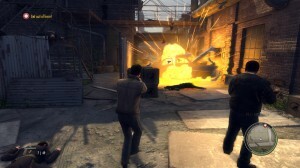 Mafia 2 isn’t a bad game by any stretch of the imagination and it is at heart a competent, visually impressive shooter. The problem is that it’s not quite as good as the earlier game, but for us to truly appreciate it we may have to wipe our memories of the last eight years. It’s certainly one of the best games of the -pretty damn quiet – summer, but the niggling doubt it could have been a lot more is hard to shake off.